Tiger Roll triumphed in a thrilling, nail-biting finish to the Randox Health Grand National to give his trainer, Gordon Elliott, a second win in the race 11 years after he launched his training career by taking it with Silver Birch. Diminutive Tiger Roll, a 10/1 chance, looked to have the race well in hand after the last fence under jockey Davy Russell, the oldest rider in the race at the age of 38, who was winning his first Randox Health Grand National. However, a late surge by Pleasant Company brought the race to a photo-finish. 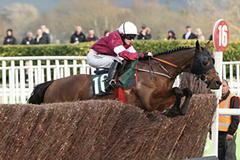 The official winning distance was a head in the favour of Tiger Roll, who is owned by Ryanair chief executive Michael O'Leary's Gigginstown House Stud. Elliott said: "I was nervous when they announced the photo-finish - I thought I had it but you are so nervous watching it. I can't believe it, to be honest. I've said I didn't appreciate it first time round [with Silver Birch] - I'll definitely appreciate it now. This is brilliant for the whole yard, for my family at home, everyone. "Tiger Roll is unbelievable. I was actually fighting with Michael O'Leary, saying that when he retires he's to keep him at home at Gigginstown, and he said, no, he's not good enough, so he'd better keep him now! I'm very lucky to be training for the O'Learys. It's unbelievable for Davy Russell - his father Jerry is, I'm sure, very proud watching him at home." He was asked whether he had any worries for Tiger Roll before the race, and Elliott replied: "I was worried about the ground. I can't say on camera how I was feeling through the race!" Asked about his tussle for the Irish training championship with Willie Mullins, who trained the runner-up, Pleasant Company, Elliott said: "Willie is an amazing man. He sets the standard; he's probably the greatest trainer of all time, so to be in the same sentence as him is unbelievable." 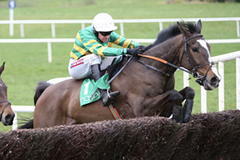 Barry Geraghty, who rode 10/1 chance Anibale Fly into fourth place, said: "It was a great effort. He got a bit close to the first and was on his head, and I was lucky to avoid a couple of fallers, but otherwise I had a great round. "I was struggling going to Becher's second time round, but he came back and he tried for me, and I thought we might get third coming to the elbow, but he just got worn out in the finish. "It was a great run and Tony [Martin] had him in great shape. It was thrill to be involved once again. It's the greatest race in the world and still the biggest thrill of the year." Willie Mullins, who saddled the 25/1 runner-up Pleasant Company, said: "We were delighted with him - he jumped from fence to fence, and while it looked like he got a bit tired going to the second-last fence he got his second wind and ran on again. "Last year he made a bad mistake at a crucial stage and that ended it for him." Mullins also ran the 7/1 favourite Total Recall and Children's List, who both pulled up. He said of Total Recall: "He was lucky to stand up - he made two dreadful mistakes as everyone saw. His chance had gone after the second error. Children's List ran a cracker and just appeared to get tired." Two years after celebrating victory on Rule The World, jockey David Mullins experienced different emotions when losing out by a head in a photo to this year's race aboard Pleasant Company (25/1). "You hope and you pray but in my heart I knew I was beaten," said Mullins. "In a war of attrition like that all you want is another stride. That's racing and I'm very lucky that I won it two years ago. It's two years since I had an experience like that. He ran his heart out. "He probably did a little bit too much with me but I had to let him go after jumping The Chair - he just winged fences. But Davy went by me on a fresh horse at the second last and I wasn't going to win that race to the Elbow. I thought I'd have one crack at him after the Elbow. I just wanted him to keep going to the winning post! "I fancied him a bit as he hadn't had his ground this season and it's not too bad out there and dried out a bit. I was sick for a couple of seconds after it but I told myself that Davy Russell (on the winner Tiger Roll) is 38 and had never won the race but I won it when I was 19." Owner Malcolm Denmark was gracious in defeat and added: "That was one of my greatest moments in racing. We got very close and I'm over the moon." Daryl Jacob, on Ucello Conti (UR 27th), said: "We were going well until we got squeezed." Barry Geragthy, on Anibale Fly, who finished third, said: "I had a ball." David Bass, on The Last Samuri (PU 26th), said: "He didn't travel as well on the ground." Sam Twiston-Davies, rider of Blaklion (BD 1st): "He jumped the fence well, but he got brought down." Robbie Power, partnering Raz De Maree (finished 10), said: "He jumped like a buck, but the ground just wasn't soft enough for him." Bryony Frost, who finished fifth aboard Milansbar, commented: "He has run a brilliant race. It's a great event to be a part of and you can be so proud of your horses and what you've asked them to do. Down by Valentines the second time round, he just started to come underneath me a bit and I had to give him a minute as it's a long way home. We went a lovely, evening gallop and he rode him in his own space - I hope he sleeps as well as I will tonight! Milansbar was incredible, wasn't he? Our scariest moment was at the first. I was thinking that he jumps so well, that he might just over jump, and he was right down on his nose. Then we got in his rhythm and he was in my hands the whole way. He missed one before the Canal Turn. He was fifth and that is an amazing feat." Katie Walsh, rider of Baie Des Iles [finished 12th), commented: "She ran well but we got badly hampered at Valentines. She's got time on her side." Paddy Brennan, partnering Chase The Spud (PU 15th), said: "He was never happy and didn't take to it at all." Keith Donoghue, rider of Valseur Lido (finished 8th), commented: "He ran a brilliant race and just got tired. I had a great spin and he jumped well." Brendan Powell, rider of Maggio (PU 18th), said: "He ran well for a circuit and then his jumping let him down towards the back." Rachael Blackmore, partnering Alpha Des Obeaux (Fell 15th), said: "He was travelling nicely but fell." Andrew Lynch, partnering Lord Windermere (UR 8th), said: "I was brought down at the Canal Turn. I still had a long way to go, but he was going well to that point." J J Slevin, rider of Thunder And Roses (PU 26th) "It was a great ride, he just got very tired and was pulled-up." Sean Flanagan, aboard sixth home Road To Riches (finished sixth), said: "He jumped great, got into a bit trouble at The Chair, but he stayed on well." Tom Bellamy, rider of Double Ross (PU 30th), said: "It was grand, he pulled up before the last as he probably just doesn't get four miles." Sean Bowen, aboard Warriors Tale (PU 29th), said: "We pulled-up in the end, but he jumped brilliantly and maybe wants better ground." Sam Coltherd, rider of Captain Redbeard (UR 7th), commented: "It was grand, he just got in tight and I came out the side door - he might go for the Scottish National." Tom O'Brien, rider of Tenor Nivernais (PU 26th), said: "It was brilliant, had a great spin around and enjoyed every second of it." Adam Wedge, aboard Buywise (UR 8th), commented: "I was just unfortunate to get brought down at the Canal Turn as it was early on, but he was jumping well." Ciaran Gethings, rider of Saint Are (BD 15th), said: "He went OK, but we were brought down." Gavin Sheehan, aboard Final Nudge (UR 8th), commented: "He jumped OK, but we unseated early on." Paul Townend, rider of Total Recall (PU 29th), said: "There were too many mistakes on the first circuit- we'll try again next year." Alain Cawley, partnering Perfect Candidate (Fell 1st), said: "We fell at the first." James Bowen, rider of Shantou Flyer (PU 26th), commented: "It was a pretty good spin and he jumped for fun early on, but he just got tired; it was very enjoyable." Mark Walsh, rider of Carlingford Lough (PU run-in), said: "He ran well but got tired." Henry Brooke, rider of Delusionofgrandeur (PU 17th), commented: "He didn't really travel. Vieux Lion Rouge, ridden by Tom Scudamore (9th), said: "We had a great spin, but he got tired." Brian Hughes, rider of Seeyouatmidnight (11th), commented: "He ran really well. He jumped really well throughout and he was really enjoying himself - he just got tired late on and considering he's run once this season, it was a great effort." 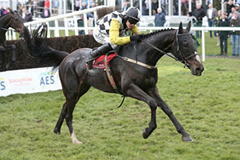 Robbie Dunne, jockey of Gas Line Boy (7th), said: "It was another great run over the fences." Harry Cobden, rider of The Dutchman (UR 23rd), said: "He was running well and was really taking to the fences before he went at Foinavon." Danny Cook, rider of I Just Know (Fell 6th), said: "He was jumping well, but fell at Becher's." Harry Skelton, jockey of Virgilio (Fell 6th), said: "He was going OK but fell at Becher's." Aidan Coleman, rider of Pendra (PU 29th), said: "He gave me a good spin but got tired." Jonathan Burke, partnering Childrens List (PU run-in), said: "He jumped like he had been going round there all his life. He just got tired."